Kickstarter games receiving oodles of cash seems almost like a daily occurrence now. Radiant Entertainment's sandbox strategy game, Stonehearth, passed its $120,000 goal on Friday with a grand total of $751,920 . The game sort of looks like Minecraft , but Stonehearth has you commanding teams of settlers to build bustling cities rather than just a single person sculpting the next wonder of the world . If anything, the game is more like Civilization than it is Minecraft. The game hosts a randomly-generated world that has monsters and “modules” scattered throughout. The modules are described as “scripted mini-adventures” with specific goals. Radiant plans to include a bunch of adventures in the initial package and will encourage modders to add more modules once the game is released. Stonehearth passed more tiers than we can list, but the major ones include a Mac and Linux port, PVP city raids, co-op, a bunch of new classes and three playable kingdoms. The final tier ($1 million) is a “persistent, connected world” that would allow players to host their own kingdoms on Radiant's servers. You have to opt-in to the PVP, however, so you don't worry about ungrateful players turning your pristine kingdoms into smoldering piles of rubble while you're away. 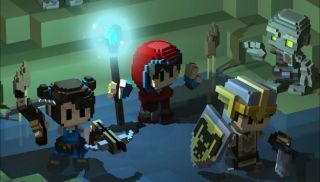 The Radiant Entertainment is also trying to get Stonehearth greenlit on Steam , but we doubt it will have any issues considering the game's popularity on Kickstarter.